The LCC specialist Indigo Partners has broadened its reach deeper into Latin America with the swift creation of JetSMART, a new ultra low cost airline based in Chile. JetSMART is one of many new low cost airlines attempting to capitalise on stimulation opportunities in Latin America as the region settles into an economic recovery. Trips per capita in many Latin American countries remain low compared to those in more mature markets, and Chile offers unique characteristics that Indigo no doubt found attractive, including the country’s status as one of the more liberalised markets in the region. JetSMART is materialising as Latin America’s largest aviation conglomerate LATAM Airlines Group is beginning to roll out a new fare structure to compete more effectively with existing and aspiring LCCs. This action is in order to obtain its fair share of passenger growth resulting from stimulatory pricing. LATAM’s moves alter the competitive dynamics JetSMART faces in the Chilean market, where LATAM is the dominant operator by a wide margin. Key to JetSMART’s longevity is maintaining a cost structure that enables traffic stimulation in Latin America’s challenging environment where high taxes and airport costs are a major feature. The company’s backers are more than familiar with fine tuning an ultra low cost operation, but Latin America presents its own unique obstacles for start-up LCCs to overcome. Only five months after Indigo Partners announced its new Chilean entity JetSMART, the airline launched flights in late Jul-2017 – a remarkably short period of time for any region of the world, but especially for Latin America. Chile is one of the easier places to conduct business in the region, and allows 100% foreign ownership of airlines. Indigo's managing partner William Franke has characterised Chile as a “nice, stable platform”. Indigo has had some exposure to Latin America previously through its stake in the Mexican ultra low cost airline Volaris; but conditions in Mexico and elsewhere in Latin America differ. Volaris branched out in late 2016 with the launch of Volaris Costa Rica, however the airline has acknowledged that significant challenges are inherent in Central America in implementing the low cost model – high taxes and airport costs. The stimulatory opportunities in Latin America as a whole, however, cannot be ignored. Trips per capita during 2015 in Peru (where the low cost airline Viva Air Peru debuted in May-2017) were 0.59, compared with more mature markets – 4.17 for the US and 2.83 for the UK. Chile’s trips per capita in 2015 reached 1.00. Indigo’s Mr Franke foreshadowed the company’s plans for Latin America in late 2016 during a CAPA event where he declared: “In Latin America Indigo has had good reception by regulators in the markets we are interested in...you shouldn’t be surprised if you see us do something there”. In addition to a less burdensome regulatory environment, other elements of Chile’s aviation market are attractive to LCC start-ups. The country’s domestic passenger have nearly doubled over the last six years from 6 million in 2010 to nearly 11 million in 2016. Domestic passenger traffic in Chile was up another 3% in 1H2017 to 5.45 million, according Chile CAB Data. Source: CAPA - Centre for Aviation and Civil Aeronautic Board of Chile. Growth peaked in 2011 to 2013, when it was consistently in the high single digits. Growth has since been in the single digits. Chile has a stable middle class, and according to the World Bank, its GNI (gross national income) per capita during 2016 was USD13,530. The country is expected to post modest 2% GDP growth in 2017, followed by projections for a 2.3% increase in 2018. LATAM and Sky Airline have operated in a duopoly in Chile for the past three years, with LATAM dominating the market. In 2014 a third competitor on domestic trunk routes, PAL Airlines, suspended operations. Chile is home to LAN, which merged with TAM in 2012 to form the LATAM Airlines Group. For 1H2017 LATAM Airlines Group held a 71% passenger share in Chile’s domestic market, while Sky held a 27% share, according to Chile CAB data. Small regional airlines (which do not compete on the trunk routes) accounted for the remaining 2%. During the past couple of years Sky has embarked on a transition to a low cost airline. The company concluded that – given Chile’s open sky policy – if it did not adopt a full low cost business model, then another airline would pursue a low cost opportunity in Chile. Sky’s efforts did not deter would-be LCCs from settling on Chile. Backed by Indigo, JetSMART aims to operate up to 10 aircraft in the 2018 period, and is challenging Sky and LATAM in nearly every market that it aims to introduce between Jul-2017 and Oct-2017. Once all the routes are launched, JetSMART will offer flights in a majority of Chile’s top ten domestic routes (measured by seats). According to the news outlet Bloomberg, JetSMART has outlined fares on some routes as low as USD13 one way in an unsurprising promotional push to gain recognition in the market. Although JetSMART will have a small presence in those markets as it slowly rolls out its network in Chile, the airline’s largest rival LATAM is working to adapt to a new low cost competitor in Chile, which is LATAM’s second largest market based on revenue generation, behind Brazil, in 2016. LATAM signals challenging conditions in Chile ahead of JetSMART's launch. Anticipating the spread of new LCC entrants across Latin America (including a new competitor in Peru, Viva Air Peru), and facing stiffening competition from existing low cost airlines in its Colombian and Brazilian markets, LATAM outlined plans in 2016 to create a new branded fare structure in its domestic markets, with the lowest tier priced to attract budget travellers through product unbundling. The company has calculated fares at the lowest rung will be 20% cheaper, and expects 50% passenger growth in Argentina, Brazil, Chile, Colombia, Ecuador and Peru by 2020. LATAM has stated that it will take two years to roll out the new pricing structure in its South American domestic markets, and it aimed to begin offering the lower fares in Chile during May-2017, followed by Peru. Earlier in 2017 Sky also debuted new segmented pricing tiers, the lowest of which is an unbundled offering. During a 1Q2017 earnings discussion, LATAM executives highlighted weakened demand in Chile and Peru, and also stated that Presidential elections held in Chile during 2017 could also have an impact on demand. The company’s executives had concluded that the tepid conditions in Peru and Chile were not driven by low cost competitors but rather, by tepid economic conditions. 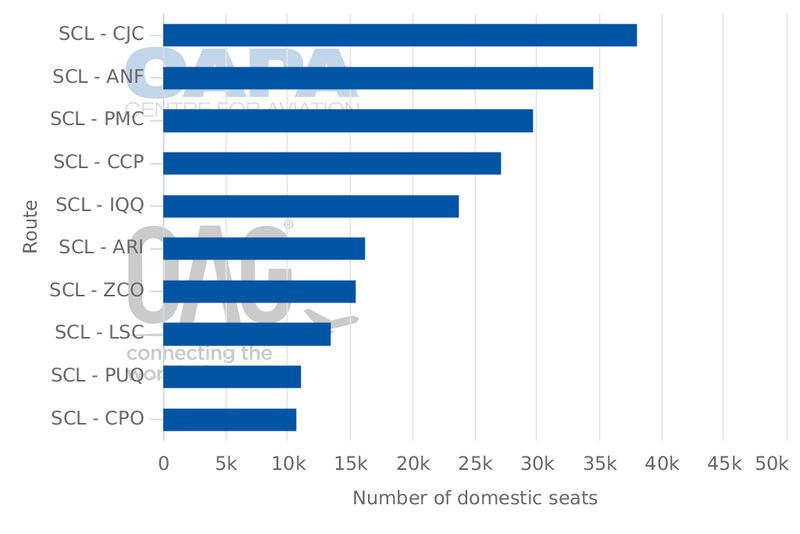 Data from CAPA and OAG show Chile’s domestic seats are projected to grow 4.3% year-on-year in 2017, which is slightly higher than the 4% increase recorded the year prior. The growth, coupled with still lukewarm economic conditions, could create challenges for Chile’s larger airlines in igniting or sustaining revenue momentum. LATAM’s unit revenues in its Spanish speaking markets declined 4.4% year-on-year during 1Q2017. JetSMART will remain a small player in Chile’s domestic market throughout the remainder of 2017 as it works to gain an understanding of the country’s dynamics, but its lower fares could create headaches for LATAM and Sky as they attempt to shore up their respective revenues. Sky (taking an offensive position) worked to transition to becoming a low cost operator, but faces the same challenges that full service and other new low cost entrants face – the high cost of doing business in Latin America. Despite Chile’s more liberalised attitude, Sky executives have cited the country’s high fees to Bloomberg, and also expressed an interest about forging dialogue with the government regarding high boarding fees. JetSMART faces the same cost hurdles as Chile’s incumbent airlines, and needs to keep its operating expenses low enough to offer stimulatory fares in an environment where ticket prices have dropped during the past year as LATAM and Sky have worked to revamp their own pricing structures to withstand new low cost competition. Chile offers an interesting testing ground for the new proliferation of low cost airlines emerging in Latin America. Although it is dominated by a full service airline, LATAM has taken preparatory steps to remain competitive, which differs from the more reactive actions taken by the company’s North American peers to combat growing LCC and ULCC competition. Arguably, JetSMART is entering a market with a certain level of existing price discounting, so it needs to undercut the existing lower fares to create a stimulatory environment. JetSMART has become the fourth LCC that has launched in Latin America during the past year, joining Viva Air Peru, Colombia’s Wingo (part of the Copa group) and Volaris Costa Rica. With these new start-ups the number of Latin American LCCs has increased from seven to 11. The stimulatory opportunities in the region remain vast, since many of Latin America’s inhabitants still travel by bus. But the challenges are just as stiff, and the success of those airlines rests on mastering the lowest cost base possible to offer fares that stimulate traffic – despite notoriously high airport taxes and fees.